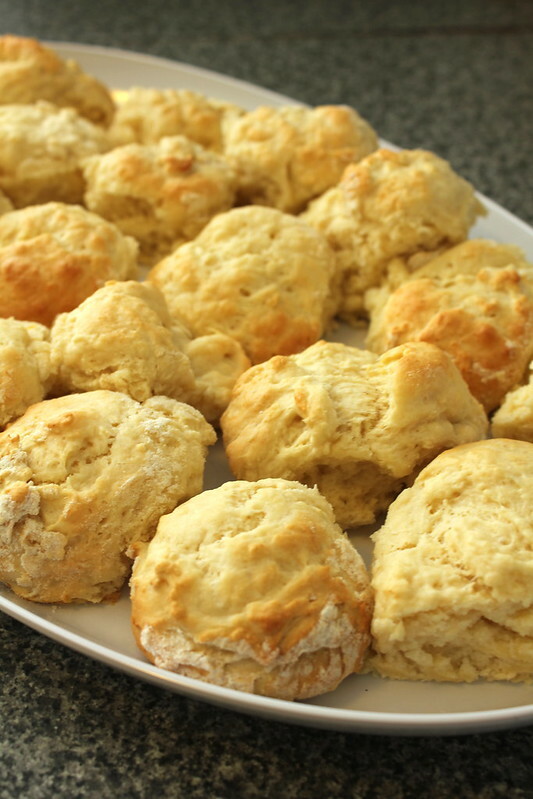 Cheat Scones – Only three ingredients! 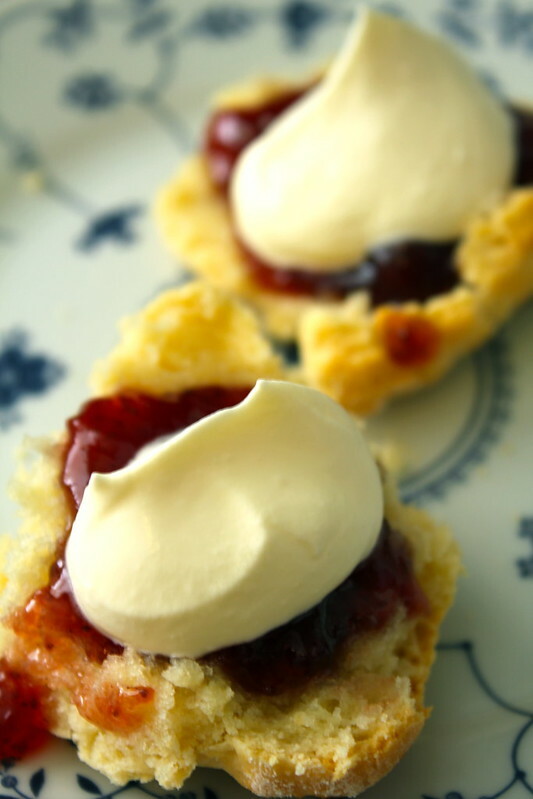 Scones (or, as I sometimes like to call them, ‘an excuse to eat jam and cream’) have always been a favourite of mine. They are perfect for picnics, girly afternoon teas, bringing a plate along to family lunches, sharing at the office or packing in kids lunchboxes! They are also extremely versatile. Into the scone batter, you could add chopped dates, sultanas, cocoa powder, chocolate chips, caramel bits, berries, pumpkin, cinnamon, nuts and much more! You could also drizzle the baked scones with a simple glaze or melted chocolate for some extra decadence. You could also try other spreads rather than the staple jam and cream — why not try peanut butter, Nutella, or lemon curd? The possibilities are endless! I am a big fan of shortcuts in the kitchen. Any way I can make recipes faster, cheaper and with less washing up is a huge plus for me! I do love cooking, but the less time spent cooking and cleaning up is certainly an attractive option! I always have plenty of other things to do, including reading up on my fave food blogs, catching up with friends and my TV shows (yay for the return of Dexter, Once Upon a Time, Revenge, Merlin and more!). Fortunately for me, these scones are an absolute snap to put together! 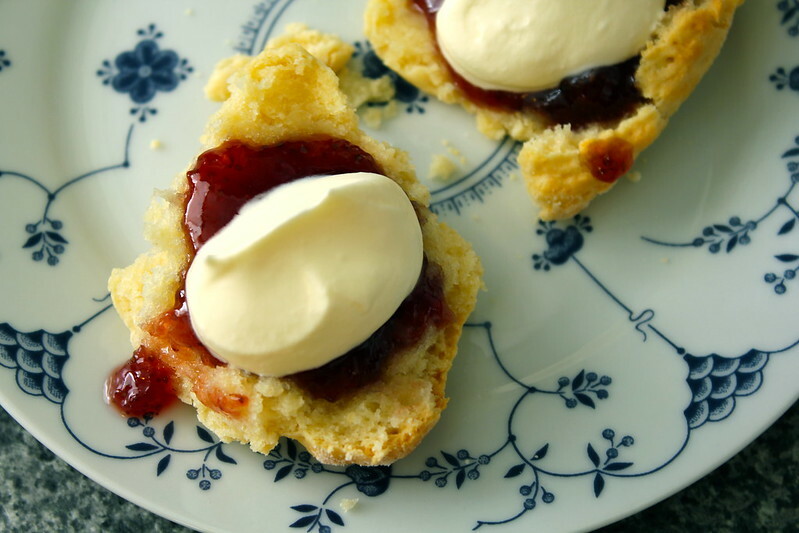 I borrowed this recipe from a work colleague who is famous for these scones and have heard many other friends say they enjoy this simple, tried and tested recipe. Are you ready? … I hope you have your notebooks ready, because if you blink, you’ll miss it! Some call this recipe “Lemonade Scones”, but I like to call them “Cheat Scones” because they’re so dang easy to make, it feels like cheating! Pour over cream and lemonade and mix together to form a sticky dough. Turn onto lightly floured surface so the dough will not stick and knead lightly. Press the dough into your workbench until it is about 2-3cms thick. 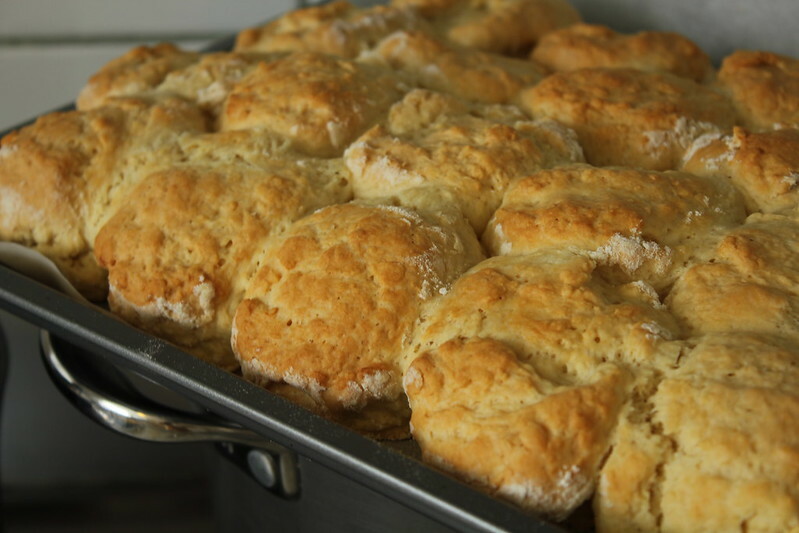 Cut with scone cutter (I dip it into flour before cutting each time to avoid sticking) and place on a lined baking tray and place all following scones together so they touch lightly (they will bake together but don’t worry – they will be easy to pull apart.) Optional – you can brush the tops with milk before baking. Bake for 15-20 minutes or until golden and sound hollow when tapped. Serve warm with freshly whipped cream and jam of your choice. These taste best fresh from the oven while still warm but are still delightful later, microwaved for 1 minute on high. This recipe also freezes well. (I just pop them in ziplock bags and throw them into the deep freeze for easy scone goodness later on!). Freshly baked golden scones just waiting to be covered in jam and cream! Hope you all had a lovely weekend! It’s so sad it was over so quickly but I hope you managed to sneak in a bit of relaxing in with all the hustle bustle! Here’s to another week, cheers! I have a baking phobia because I always think I might over or under bake cookies etc. This might just be a recipe simple enough for me to handle. I love lemonade scones, and they really are foolproof, and so SO good! I’d love for you to submit them to the High Tea blog hop I’m hosting as they fit the theme perfectly! Oh Christine, you do know how to make me salivate! (charming I know lol!) have had this recipe before and it was delightful, however I have also tried my hand at the same recipe and they turned out like rock cakes. Hmmm… maybe it’s time to put that disaster behind me and give it a whirl again. I didn’t knead the mix when I tried it, but used a flat edged knife like my grandmother taught me, so maybe that is where I went wrong… we will see!! 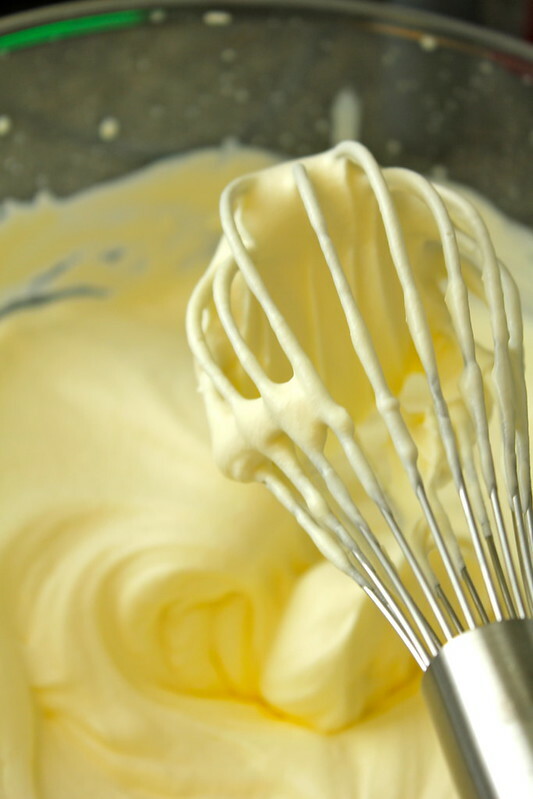 Can you use pure cream, or must it be thickened cream? Wow, lemonade scones? That’s not something I’ve tried before but it sounds interesting. What effect does the lemonade actually have? Oh what an awesome idea Sara!! Thanks for linking me the post, I shall definitely give it a try!! Yeah I agree! Fanta scones, I wonder if those would taste orangey..hmm. Sara from Belly Rumbles was saying she made creaming soda ones which is pretty cool too! I…still can’t believe it only uses 3 ingredients. AMAZING! I know scones is one of kinds hard to bake, but yours looks so awesome. Will definitely try it out. Yum!!! OMG i had to reread the title of this post twice before it sunk in 🙂 WOW! Scones with only 3 ingredients? And I have them all at home? I can whip up scones in a couple of minutes? YES PLEASE! For three ingredients, these look perfect… Yum. Thanks for sharing. Um….these are brilliant. Like Albert Einstein level. Who would’ve though you could make something so soft and puffy that serves as the BEST vehicle for add ons with such little to begin with? Book marking to make VERY soon!!! Add dried mango or dates chopped finely. You can also replace the cream with coconut cream. Tastes amazement!! I’ve have changed the cream for coconut cream as my husband is vegan. First attempt at making scones & I’m worried I’ll offer bake them and they’ll be like rock cakes . Aww thank you 🙂 I find that hard to believe with all your cooking prowess on your blog!! I agree that scones are little more than an excuse to eat jam and cream! Nothing wrong with that in my book. 😉 Nice, easy recipe – really simple recipe, my favorite kind. Good stuff – thanks. I have heard about lemonade scones but I didn’t realise they are so easy to make! Hi Christine! Nice to meet you! Just 3 ingredients to make scones? WOW!!! These don’t look like some recipe that is made easily! Looks wonderful! Awesome recipe!! I had no idea you could make scones with only 3 ingredients. Also love your idea for putting corn flour in the cream to stabilise it. Awesome recipe Christine! Love the simplicity of the recipe yeilding such a fantastic result! These look fantastic, I can’t believe you only need 3 ingredients! Looks fantastic! I’ve bookmarked these to try. Do you think this would work with soda water instead of lemonade? I don’t need an excuse to eat jam and cream but these look like a pretty good reason! I miss these lemonade scones. So easy and yet so delicious! This is so interesting! I’ll definitely be trying them…3 ingredients?! I’m so in! Whattttt these sound so good!!! I just made oatmeal peanut butter chocolate chip scones last night and am totally on a scone kick. I will have to try these–thanks for an awesome recipe!! Can you freeze these raw or do you cook them first? They sound amazing 🙂 making them today!! Hi Katherine, I have never tried freezing these scones raw before – I would bake them first. Hope you enjoy them! I live in the U.S. What would be thickened cream here. Sour Cream or whipping cream. We don’t have thickened cream here. Love this recipe. I add a pinch of salt flakes.